A yacht charter is the best way to explore the dramatic coastline of Turkey. The coast boasts a number of beautiful sheltered bays, perfect for an afternoon at anchor, some snorkelling and water sports. With its rocky landscapes, medieval towns and the genuine hospitality of the Turkish people, no doubt you will enjoy your adventure in Turkish waters. The southern part of the country has lots to offer: from picturesque seaside towns to fine dining restaurants, lavish hotels and oriental bazaars. A yacht charter in Turkey usually includes Bodrum, Marmaris, Gocek and Fethiye. However, you can also cruise the Bosphorus and reach Istanbul. 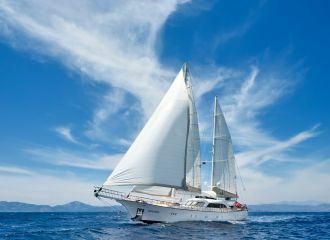 A yacht charter in Turkey can be combined with nearby Greek islands of Kos, Simi or Rhodes. 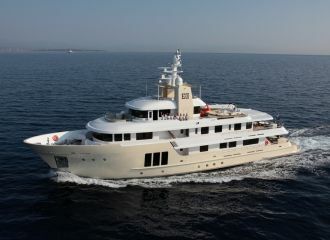 At Talamare, we believe that experience can turn a special yacht charter into an extra special one. Take a look at the few examples below and contact our charter planners for details and recommendations. If you’re looking for a relaxing time, step into a Turkish bath and revitalize your body during your yacht charter holiday in Turkey. Embark on a wooden boat and cruise up the Dalyan River to discover the Lycian rock tombs and the ancient ruins of Caunus. Enjoy a paragliding adventure down the Babadag. Incredible views over the Mediterranean and sometimes all the way to the Greek island of Rhodes. The trip is a bit long but it’s worth it. The lively seaside town of Bodrum is a great stop during your yacht charter in Southern Turkey. The city boasts stunning panoramas and has some interesting ancient ruins. One of the main attractions is the magnificent castle overlooking the sea. This waterfront restaurant has beautiful views over the castle. Great Mediterranean food, attentive service. Great selection of mezze. The impressive medieval castle of Bodrum is home to an interesting museum where you can learn about underwater archaeology. Fethiye captivates every visitor by its charming old town and natural scenery. The city is home to famous rock tombs and the remains of an ancient theatre. Located in a hotel this restaurant has a lovely terrace overlooking the bay and serves delicious food. A beautiful little find. The mezze platter is particularly good. A 5-stars hotel with a great restaurant called Pashal and an enchanting spa. With its hidden coves and beautiful turquoise waters, Gocek has always been a popular yachting spot. The town has some great entertainment and the natural surroundings are lovely to explore. Beautiful surroundings, great atmosphere, delicious food, attentive service. A must-try if you’re around. We love the octopus carpaccio! A wide bay surrounded by pine trees with some ruins caused by earthquakes. According to the legend, as Cleopatra approached the Turkish coast, some of her relatives decided to build Roman baths for her as a gift. It is said that the secret to her beauty can be found in the waters of the bay.